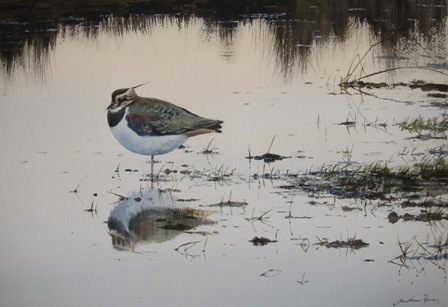 A watercolour finished this weekend showing a Lapwing on flood water near Coxwold. 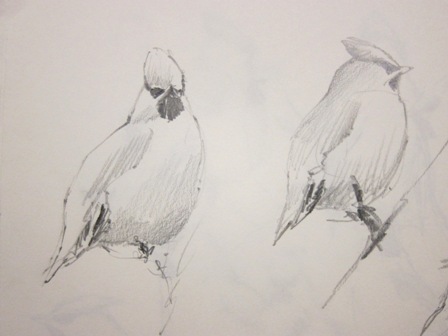 The Lapwing was from sketches made in December. The painting combines very fluid background watercolour wash for the water with thick almost dry watercolour to give contrast in the composition. This painting will be exhibited at my forthcoming exhibiton at Helmsley Arts Centre, starting in the last weekend in November. A quick trip to Kirkbymoorside at dawn. 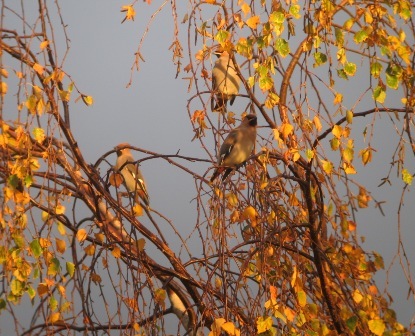 Found the Waxwings in the top of a birch tree illuminated by strong rising sunshine- the colours of the birds(14 today) and golden leaves of the birch against a dark sky were unforgettable. The invasion began last weekend, with many Waxwings arriving in Scotland and down the East Coast of England. I am always eager to find these exotic looking winter visitors and start my search in the summer. I take note of rowan trees wherever I drive in readiness for an arrival of Waxwings. It is rowan berries they go for first. 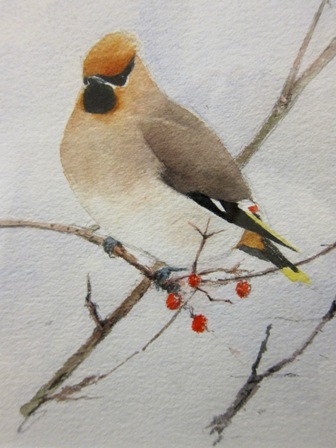 If you know where the rowan trees are the search for the first Waxwings of the winter is much easier. So this morning I set out early to wait for a very gloomy dawn. Eventually I found a flock of nine Waxwings on some rowans in Kirkbymoorside. They looked quite sleek in the mild temperaures- last night’s minimum temperature was 13C. Anyone who has watched them in the depths of winter will know how much they can puff their feathers up. 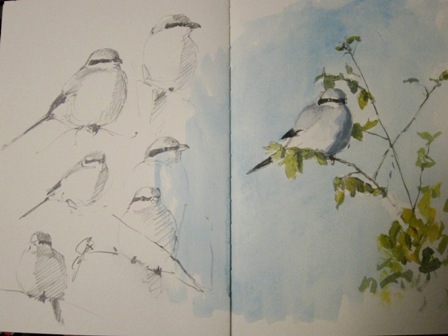 Their distinctive trilling calls, a real sound of winter, took me back to my last sightings in and around Skipton in 2008. October sightings of Waxwings are unusual, this invasion is an early one and I anticipate many more sightings in the months to come. 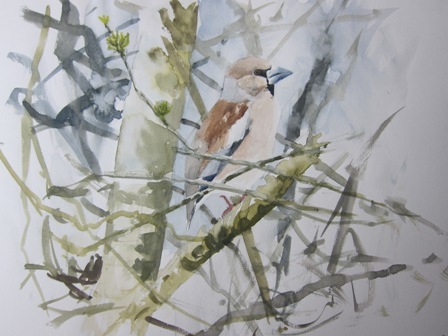 A brief view of a Hawfinch this afternoon. West Monkton has frequently yielded sightings of this elusive finch. It has a mix of very old trees with many beech and yew, both of which attract Hawfinches. I am sure somewhere there must be some hornbeam too- the seeds of hornbeam are a great favourite of this big, but elusive British finch. If you want to find one, learn to identify the call, a sharp ‘tick’ uttered as the bird flies from cover. Also in the village a flock of about 20 Fieldfares dropped down to inspect a large orchard, a small flock of siskins and amazingly a Woodcock flushed from exactly the same spot I saw one in January last year. A few days in Somerset have yielded some excellent sightings. Yesterday morning a trip to Shapwick Heath found me in a frosty landscape well before dawn. Cetti’s Warblers seemed to be calling every fifty yards or so, a bird still very uncommon in North Yorkshire. A huge flock of starlings drifted west on their way out from their roost, their wings making a soft breeze sound as the flock passed above me. As I approached the dead trees at the back of Noah’s Lake a Great Grey Shrike popped up onto a branch briefly, then almost immediately dropped out of view. This frustrating view became more so as fog descended- I couldn’t even see the trees for about quarter of an hour. As the sun rose higher and evaporated the mist the trees were visible again, but the shrike was not. I decided to head back down to the West end of the Roughet area. By now the mist had cleared and I quickly found a shining white bird in the top of a birch tree. 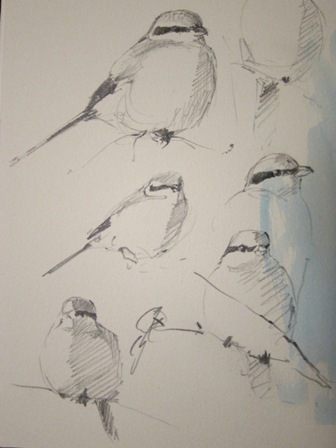 I made some sketches of this immaculate looking bird with its feathers puffed up in the frosty weather. 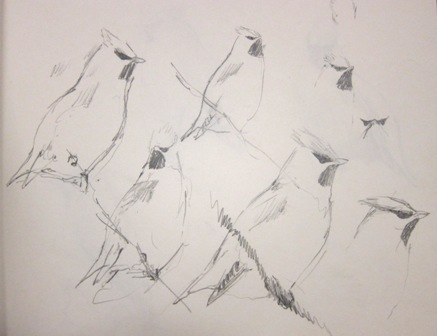 They are lovely birds to sketch with pristine plumage and bold markings. For a while four Redpolls ‘danced’ around the shrike on undulating stalling flight, the shrike literally snapped its beak with hunger as it watched these tempting little ‘snacks’! 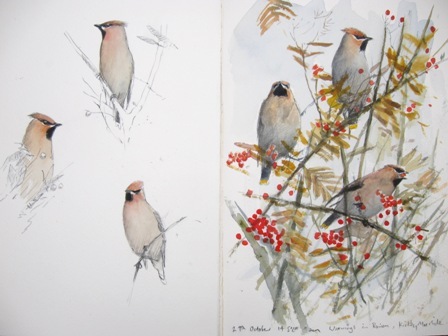 Together with my watercolour group I have been painting natural objects which epitomise the season. 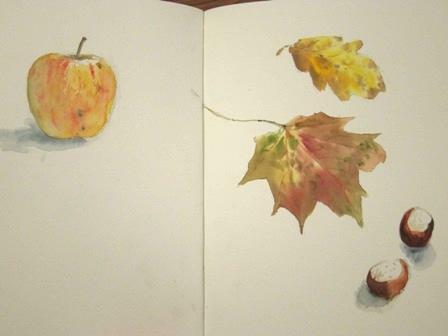 Studying a newly picked apple, leaf or conker gives a great opportunity to enjoy using different techniques in the medium of watercolour. 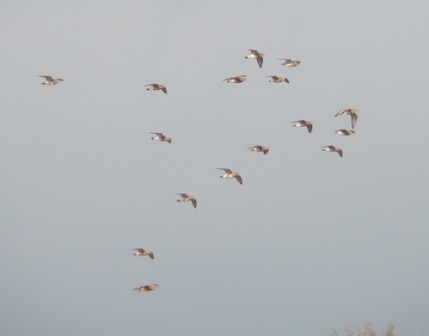 The first large flocks of Fieldfares moved east over Ampleforth on the 20th October. 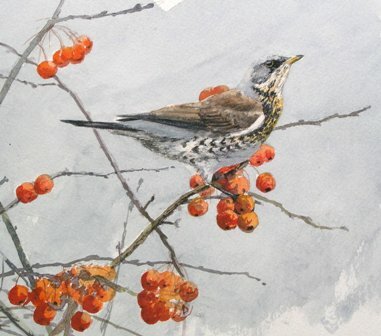 These slow moving flocks move west often with Redwings for company. Their harsh “chack, chack, chack”calls are for me a real sign that Autumn is nearing its peak, so time to be ready to enjoy the colours through the end of October and early November. The cultivated fields on high ground around Ampleforth are hosting huge flocks of Lapwings and Golden Plovers. I have had some super views of both these species as the search newly tilled fields and pasture for worms. When Golden Plovers take flight they are a spectacular sight all turning together, their light underparts are shown off to best effect(as today) when seen sunlit against a dark sky.